On January 6th we celebrate Epiphany, or La Fête des Rois, a festival dating back almost 2,000 years. Epiphany marks the official end of the Christmas period, and is said to be the day on which the three kings arrived bearing their gifts for the newborn baby Jesus. No Christmas tradition would be complete without its traditional accompanying food, and Epiphany is no exception. A very French custom such as this of course uses a staple of classic French cuisine, the galette. Roll out the puff pastry and cut out one base of 22cm, and another of 24cm. The base should be about ½cm thick. Wrap the pastry in plastic wrap and refrigerate for an hour. Whisk all ingredients for the almond cream together. Refrigerate until the pastry has chilled. Place the bottom base (the smaller circle) onto a plate. Place the cream mixture in the middle and smooth into an even circle leaving a 4cm gap at the edge. Place your small figurine in the almond cream. Brush some of the beaten egg yolk on that 4cm gap and drape the pastry top onto the almond cream. Press down gently to get rid of air and seal the edges by pressing down. Chill in fridge one hour. Place a baking sheet into the oven and heat to 375F. After it has chilled, remove the galette and trim the edge with a sharp knife. Brush your galette with beaten egg yolk. Gently score a spiral pattern with the blunt side of a knife in the top of the pastry making sure not to go all the way through. Transfer to your hot baking sheet and bake 45 minutes. Let the galette rest for 5 minutes before serving in slices. If you’d like to truly embrace the tradition you’ll need to hide two figurines in the centre of your cake, a tradition which can be traced back to Roman times when beans were placed in the middle of every Epiphany galette to signify the black and white beans which were used for voting in Roman elections. The same beans were used to discern the King and Queen of the Festival at the Roman feast of Saturnlaia, which took place each January, and that’s why if you’re the lucky finder of one of your galette’s hidden porcelain figurines, you’ll be crowned too. 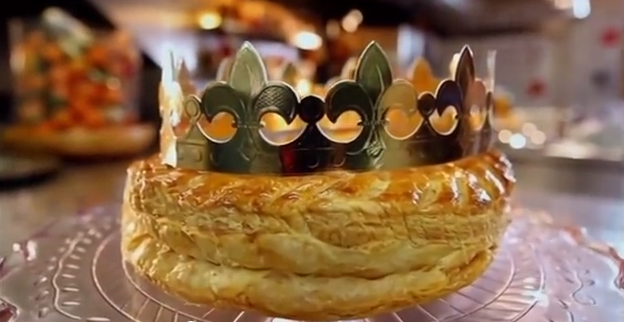 If you have a go at making Raymond’s Galette des Rois we’d love to see a picture! Tweet us @brasserieblanc to show off your Epiphany masterpiece.